I couldn’t believe it happened to me again. When someone says something like that, it’s usually a negative thing. A speeding ticket. Getting stood up. Getting crapped on by a pigeon. Stuff like that. On Sunday, it happened to me twice. The it? The awesome unshakable feeling of enthusiasm to the tenth power. I was oozing with this great you-did-it feeling. I guess most people call it pride. And it lasted the whole day. 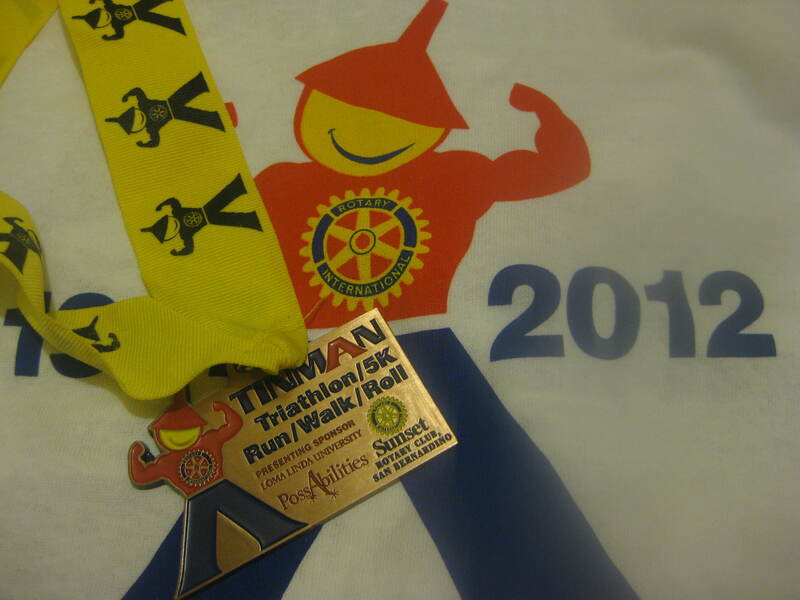 I earned my TinMan Triathlon medal, and I’d like to thank every single muscle in my 36-year-old body for contributing to this accomplishment, because it wasn’t easy. The day began at 4:30 a.m. and even though I’m not the greatest morning person I made my way through a morning routine and jumped in the truck. As I drove to the race, I was still a little nervous, but as I was changing the radio stations I heard one of my songs … Give me ho! if you got your funky bus pass, ho! ho! ho! The Double Dutch Bus coming down the street … Then it was followed by Maroon 5 singing Payphone and then the jams kept coming all hour-long. I was going to do well. And I was going to finish the race. I was on the positive track and that was the right place to before the race. 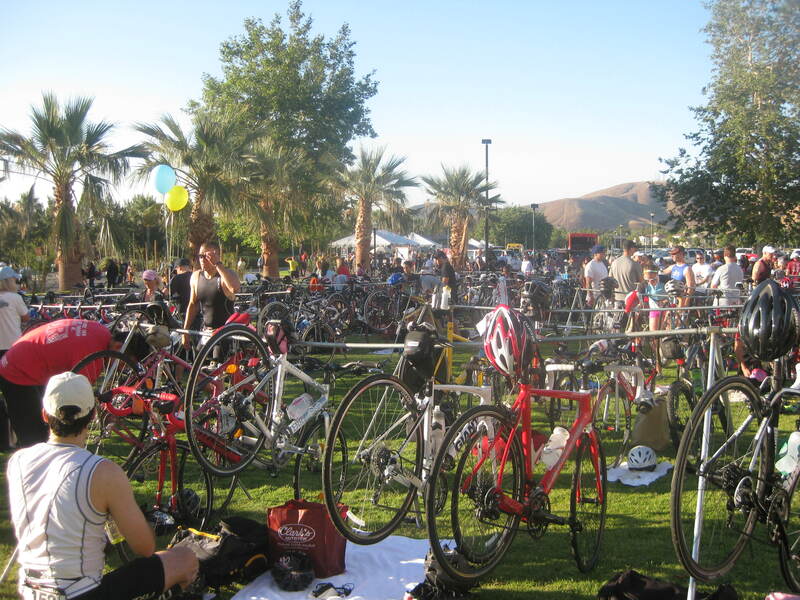 I got to registration, set up my bike and little transition stand, then made my way to the starting line. 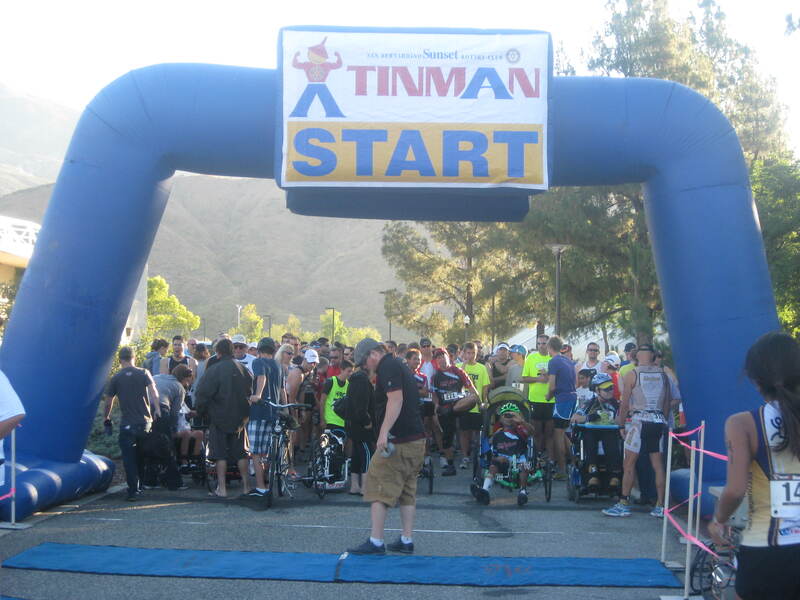 There were no crazy costumes in this race, but everyone seemed to be looking the IronMan part. You know, wearing those biking/swim suits so you need no transition from bicycle to pool. You just get off the bike and go. And once again, there I was with shorts and a t-shirt. But I still felt good. The fact that I had the number 160 written on my left arm and calf made me feel like I didn’t need IronMan clothing to participate in the race. T-shirt and shorts were just fine for The Guat. No need for a hundred-dollar wetsuit or fancy Tour De France looking bike apparel. I was sporting 160 ink on my body and that was good enough for me. I heard the countdown, followed by the ding, and I was off. I hadn’t worried too much about the running part of the race. I felt that my post-Warrior-Dash training would help me out in this. And it did. 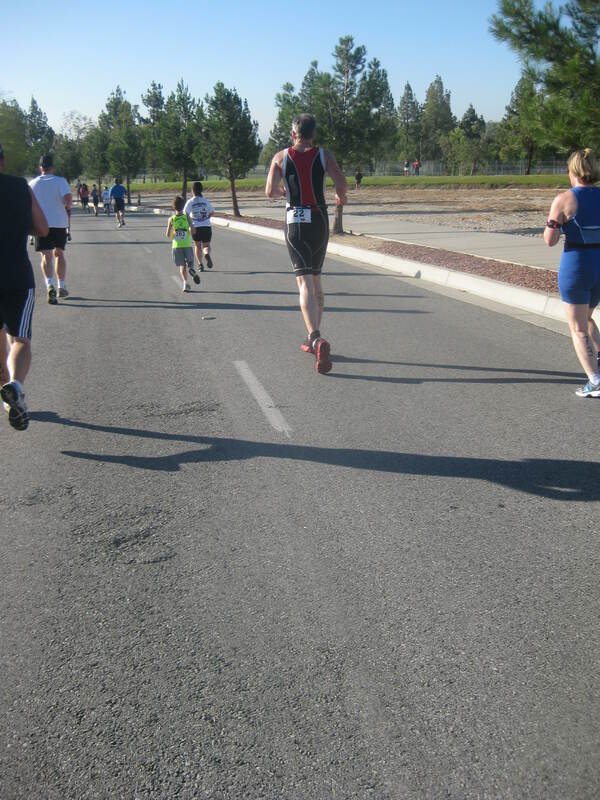 I passed many of the triathletes that sprinted the first hundred yards. I started slow, but made my way through the pack and found a good pace. Passing up all the IronMan looking people. I thought I was doing well. Until I saw him. Can you see Happy Feet Running Club Kid in the yellow? There he was running away, not even breathing heavily. In fact he was actually having a conversation with the person next to him, which he eventually passed. There he was … A ten-year old kid with his Happy Feet Running Club shirt passing me by at mile two. I couldn’t believe it. There he was, Happy Feet Running Club Kid, running smoothly. Practically no sweat. But he wasn’t running in the triathlon. They had a 5K race for kids, and he was one of the many participating. So once the running phase was done Happy Feet went one way and I went the other. Even though Happy Feet finished a little bit ahead of me I was glad I had made it to the end without stopping. A lot of people began walking at mile two as the early sun began beating down on us. You would think early sunshine would not be hot, but it was, I had the sweat to prove it. 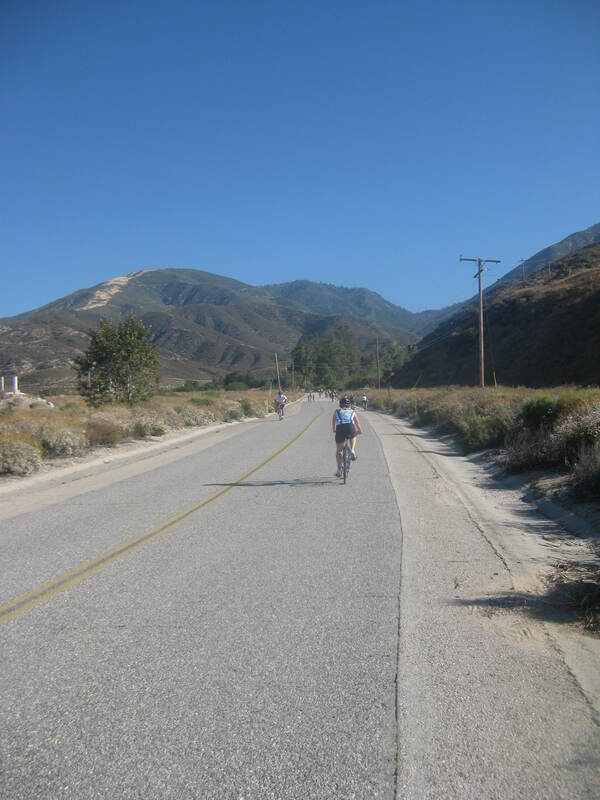 Once I got to the biking part I felt relieved. I thought I would be cruising during this part of the race. They call it Devil’s Canyon for a reason and my quads were in hell. This was the toughest part of the race. It started off pretty good. Zooming past the straightaways, but then when the incline began I had to change to lower gears. I passed by the residential areas and kept making my way uphill. Then I came across a security guard who was pedaling without a helmet. He was going up the hill faster than I was and he did not have a 21-speed bike. Apparently he was on his way to work at the nearby university. It was his daily route. I told him he should have entered the race, he would have done well. He laughed and pedaled passed me. Once I got through the residential areas, I saw it. The hills. The never-ending incline up to the mountain. It was so steep that some Tour De France looking people with professional bike shoes got off their bicycles and began hiking up that monstrosity. But I pressed on and kept changing gears. Then, just when I thought I had reached the top, I hadn’t. It just kept climbing and climbing. Pinche Devil’s Canyon. My quads were burning, and for some reason my lower back felt like someone was stabbing it. All that strain going up hill must have put a kink back there, and all I could think about was … man I should have brought a radio. I might have been able to groove my way up the mountain. I even tried singing, trying to remember all the lyrics to the jams I heard in the morning. But it was useless, I messed up the lyrics and got tired of singing the same song four times in a row. So I got off to drink some water. 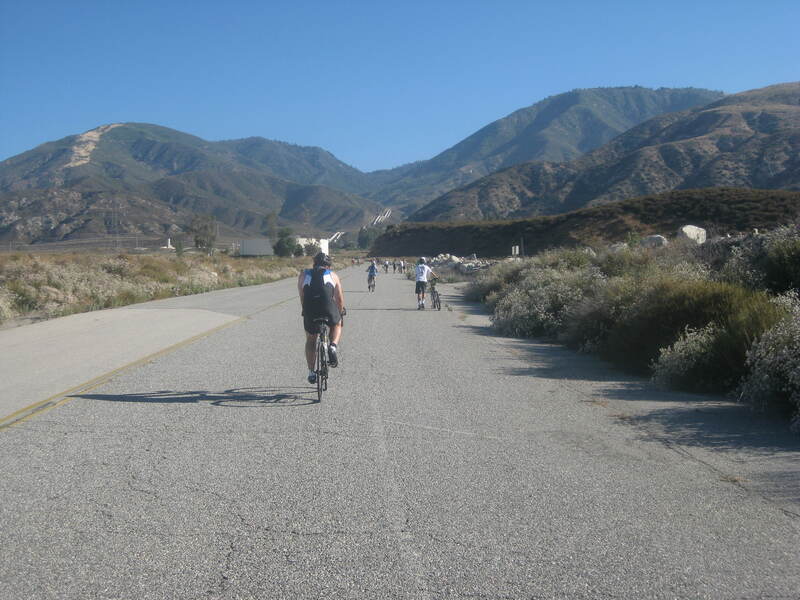 But then I couldn’t get back on to pedal, so I became one of the hikers. The sad part was that I only walked for about five minutes, before reaching the top. If I had held out a little longer, I would have made it through without stopping. But I had no idea what was lying behind that curve. I thought it was more mountain. Instead it was two older ladies from the local Rotary Club passing out water and encouragement. Even though I reached the top on foot, that didn’t matter. I just got on the bike and made my way down hill. A fast trip down hill. I was hesitant once I got to the swimming part, seeing how I only got in the pool once during my training. But it wasn’t as bad as I thought it would be. There were lifeguards galore. So I plunged in. Six laps. I started off with freestyle, then turned to the doggie paddle. After four laps I was exhausted, so I just decided to do the backstroke all the way to the finish. No crazy cramp. No need for CPR from the lifeguards. I floated on my back and splashed to the end. Even though they had a be-careful-it’s-slippery sign right out of the pool, I began jogging to the finish line, barefoot. It was about 100 yards. 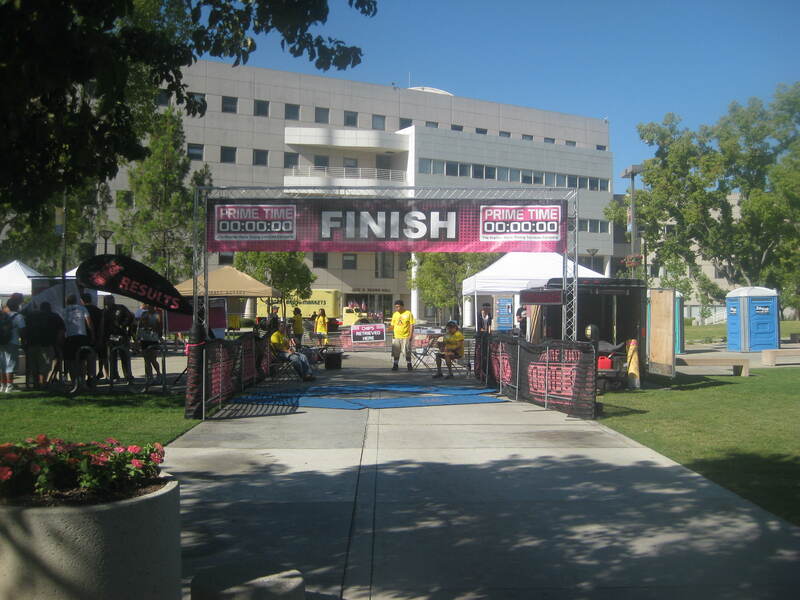 Once I saw the finish line I smiled. I had never been so happy to see something pink, and for those of you who know me, know that I hate pink, every shade of it. But today… today was the day I was happy to see pink. I crossed the finish and smiled. One hour and thirty-eight minutes. It was the best hour-and-a-half I’ve had this year. I was a TinMan. Wow, you really do rock. What a great post and achievement! This one’s for ya . . .
Ha! I love it! You crack me up. I remember this song. I was thinking about it during the Warrior Dash and this race. Thanks for the props 🙂 And thanks for adding me to your Blog Roll I’m moving up in the world. Yep. I’m with Kitt on this. Definitely going to hit my NordicTrack after reading this. Good one, Guat!